It’s only taken one episode but it seems the Great British public has chosen it’s winner of I’m A Celebrity already. One hour and 45 minutes into the new series and Stanley Johnson has already emerged as fans’ favourite to win the entire thing. Of course, Stanley isn’t the Foreign Secretary and putting British nationals’ lives at risk abroad but he seems to possess the very same sort of charm that has led his son to such success in the political sphere. Right, started watching #ImACeleb 20 mins late. Stanley Johnson has no idea who Ant & Dec are let alone who the "celebs" are. Stanley Johnson – "who are Ant & Dec?" Reply: "they're are the hosts"
Stanley Johnson – "what's a reality show?" Reply: "it's what you're on now"
As if that didn’t get people falling in love with him quickly enough, it was his first challenge that also got people belly-laughing. He had to out his hand into some holes where nasty critters were lurking to pick out some pieces of a puzzle. But it was his little anecdote about squids afterwards that had people really talking. While he had been bitten by a critter (a crab) he didn’t have a clue and thought it could have been a squid before telling the British public a little knwon fact about squids having vicious beaks with which they bite. At this rate Stanley is going to win this at a dressage. But that’s not all the British public were talking about as Dec opened up the show with a savage joke about Ant’s stint in rehab. After the Geordie duo did their usual ‘Get Me Out Of Heeeeeeeeeeere’ scream on the bridge, they moved over to the studio with the TV where Dec happily began ‘reading off the autocue’. Before being cut off by Ant who wondered why he’d said that. Dec hilariously checked his earpiece where he told people he was reading off the old autocue because he ‘thought Ant wasn’t going to make it’. Ant quickly set the record straight and said ‘as if he wasn’t going to be here’ before embracing Dec in a hug. #ImACeleb Where's Holly Willoughby ffs ??? 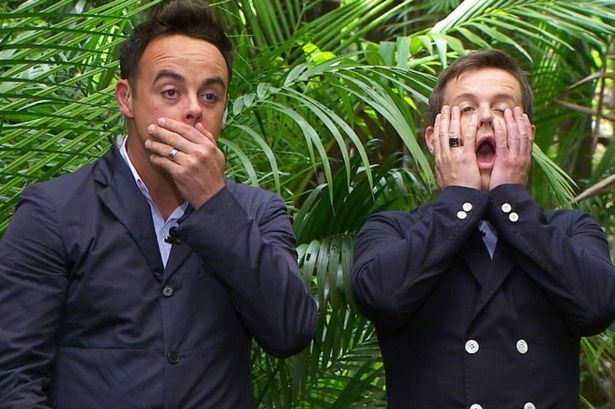 Ant when Dec said Holly Willoughby… ? "…with the gorgeous Holly Willoughby"… wrong script ? Hilariously, that wasn’t the only joke Dec made about Ant’s time in rehab. Shortly before the end of the show, Dec asked Ant where he’d been all summer, leaving Ant to defend himself by smiling into his mug of tea and telling everyone he was busy.